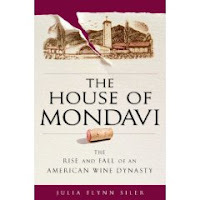 "The House of Mondavi: The Rise and Fall of an American Wine Dynasty" is due in bookstores in June. Wall Street Journal contributor Julia Flynn Siler authored the book and, although she has no personal history with the Mondavi’s she conducted extensive research and interviews — including with Mondavi family members — in an attempt to provide an unbiased account of the troubled clan. The book is expected to cause quite a stir and no advanced copies are available for review.